One of the perks of working in a library is that you come across titles that you might not otherwise stumble across. Such was the case for me in 1999. While shelving titles, I discovered a new book, The Quilter's Apprentice by Jennifer Chiaverini. After reading the cover flaps, I quickly learned the author, Jennifer Chiaverini, resides in Wisconsin. I always make a point of reading books by authors from my home state. The book's subject also appealed to me right away. Recently married, I had received a special quilt made by my grandmother for my wedding. A cherished and personal gift, I know my grandmother spent much time lovingly piecing it together with my husband and I in mind. Powerful and memory evoking, it's amazing how quilts can tell stories and bring generations together. As I cracked open The Quilter's Apprentice and started reading I found an intriguing story involving two interesting characters, one elderly and one young, whose lives were brought together through quilting. I thoroughly enjoyed Chiaverini's first novel and over the years have read all of the books in her Elm Creek Quilt books series. Earlier this week on February 21st, Chiaverini released Sonoma Rose, the 19th book in her bestselling series. Sonoma Rose is an adult, historical fiction novel set in California during the Prohibition era of the mid to late 1920's. The book explores the story of Rosa Diaz and Lars Jorgensen, lovers that are forced apart in their youth by old family resentments and personal choices. In a series of flashbacks readers learn that Lars previously struggled with alcoholism and Rosa, finding herself pregnant, decides to marry John Barclay, someone she does not love but deems stable. John becomes abusive and also becomes involved in various lawless activities. John and Rosa disagree about how to best care for their children, who are stricken with celiac disease, a mysterious and fatal (without proper treatment) affliction. Lars slowly reenters Rosa's life and, at first, Rosa tries to keep him away. Eventually John's violent nature escalates and he almost kills a man. Lars and Rosa seek out each other and escape together with the children to wine country in northern California. Lars is wanted by the mob because he reported John's involvement with illegal liquor trafficking. The pair finds work and a home in the countryside at a vineyard owned by second-generation winemakers, the Cacchiones. While working there they learn all about the difficulties faced by winemakers and the dangers of bootlegging during Prohibition. Lars and Rosa struggle to find happiness together and though they live in fear that they might be discovered by the mob or by John when he exits jail, they remain hopeful for a better future. Although Sonoma Rose can be easily treated as a stand-alone novel, it is truly a sequel to The Quilter's Homecoming, a story that focuses on the character of Elizabeth Nelson, a cousin to Sylvia, the founder of the Elm Creek Quilt Camps. When Elizabeth moves from Pennsylvania to California, she befriends Rosa and locates previously hidden quilts from Rosa's family's past. Elizabeth, in a sense, provides the tie to the other Elm Creek series stories and her character is also introduced in Chiaverini's The Christmas Quilt. The novel, Sonoma Rose, fleshes out the details found in The Quilter's Homecoming and supplies a satisfying ending to Lars and Rosa's story. Win a copy! This review is part of TLC Book Tours, and Dutton / Penguin has kindly offered to give away a copy of Sonoma Rose to a lucky Brimful Curiosities reader! For a chance to win, leave a comment relating to this post or if you're a Chiaverini fan, let me know the title of your favorite Elm Creek series book. • Contest ends on Monday, March 12th, 2012 at 11:59 PM CST. I've read a couple of her quilting books but nothing lately. I'd love to read this one! My favorite book in the Elm Creek series is The Christmas Quilt. 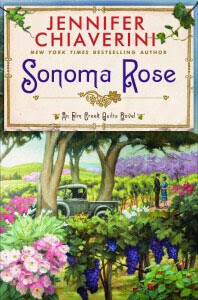 I would love to read Sonoma Rose. I haven't read any of her books. I know I would enjoy them by your description. This sounds like a wonderful series! Glad you enjoyed this latest entry. I read all of the Elm Creek Quilt books quite a few years ago. My fave is always the first and never the last because I get so into all the characters I hate to see it end. It was enjoyable getting to know Sylvia and Sarah and how their relationship grew. I would love a chance to win Sonoma Rose. Please count me in!